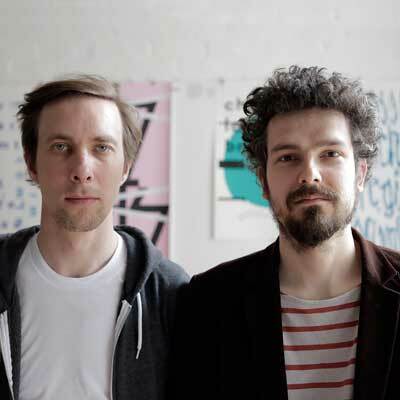 Founded in 2001 the Berlin-based design studio Zwölf consists of Universität der Künste alumni Stefan Guzy (*1980) and Björn Wiede (*1981). The studio is famous for its minimal typographical posters, who have been exhibited in poster biennal like Warsaw, Moscow, Toyama and Chaumont amoung others. The studio's output was awarded with prestigous awards like Art Director' Club Gold and is regularly featured at Type Director's Club annual exhibitions in New York and Tokio. Recently Guzy and Wiede won the traditional Kieler Woche poster contest for 2015. The studio is also running the printmakers workshop "Handsiebdruckerei Kreuzberg" for bespoke hand-pulled screen prints in their premises.